The importance of training and exercising cannot be overstated, particularly to prepare staff for international field operations in difficult and often high-risk environments but also to ensure understanding of mandates, systems and procedures. 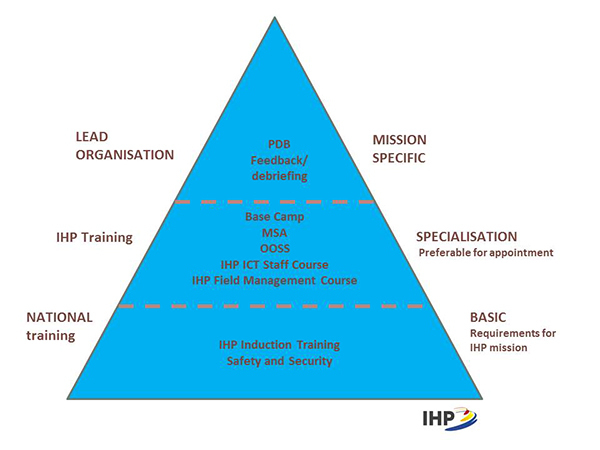 The IHP members have strong institutional training and exercise capabilities. The members have training centres with facilities designed for both indoor and outdoor training events. IHP hosts other organisations’ training programmes, such as UNOCHA, OCHA/UNDAC, WFP and UNHCR. Individual IHP organisations also provide trainings to different UN organisations, the EU and the IFRC. IHP hosts or supports other organisations' training events, for example the UNHCR Workshop on Wemergency Management (WEM), UNDAC induction training etc. - Basic trainings - E.g. induction trainings and UN safety and security in the field, with the aim to provide understanding of the IHP framework and concept and the international humanitarian response. - Specialisation trainings - Trainings based on IHP modular support packages e.g. base camp management, ICT, Information Management etc. - Mission specific trainings - Specific pre-deployment trainings and briefings with the aim of preparing staff and teams for an emergency assignment. Exercise TRIPLEX is an IHP exercise focusing on strengthening preparedness and response regarding coordination and effective emergency response. Within this main purpose, there are a number of aims, one being to provide a civilian planned and managed training platform. The targets of this platform are relevant actors to train humanitarian response and especially coordination and cooperation. Another aim is for IHP to train internal cooperation and compatibility as well as training coordination, cooperation and support to/with humanitarian actors. TRIPLEX is a large-scale field simulation exercise providing a unique value as one of only few civilian-run multilateral humanitarian response field emergency simulations. Additionally to the IHP members, the exercise regularly involves, amongst others, OCHA, WFP, UNICEF, UNHCR, IOM, WHO, the IFRC, OPCW, the EU (ECHO), Non-Governmental Organisations, and military organisations’ CIMIC. The last Exercise TRIPLEX took place in Norway in 2016, hoisted by DSB, with the participation of over 30 organisations working in humanitarian emergencies. There was participation of citizens from over 50 countries worldwide. The next TRIPLEX was planned to be carried out in August 2019 but due to uncertainty about funding the exercise was postponed until 2020. The exercise is now been cancelled since the host did not have the necessary resources available in 2020. IHP is therefore currently (spring 2019) investigating what the possibilities are of carrying out another exercise TRIPLEX at a later date. The next Exercise TRIPLEX was to be in 2020 but has been cancelled. IHP is looking into when the next TRIPLEX can take place, where it should take place, and which kind of exercise.